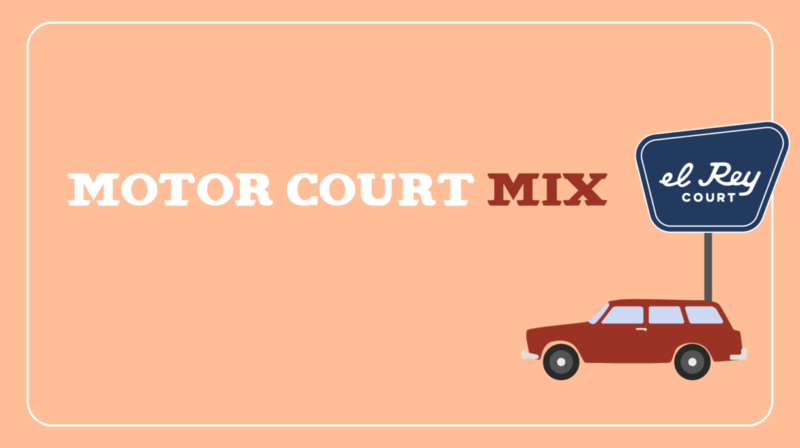 Put some mojo in your motion by motoring, moving, meandering, and otherwise motivating yourself to Motor Court MIX this Thursday at the recently and radically revitalized El Rey Court. This is one MIX that is gonna make you wet with wild, poolside professional networking. At the in-house La Reina At El Rey Court cocktail lounge, your first beverage is on the house when you surf through our crowdsourced survey. You’ll be able to choose from a Piña Picante cocktail, a vinho verde or a sultry cerveza. Royally rocking free foodstuffs will be on hand from regular La Reina Thursday night food truck Back Road Pizza and new Crowntown culinary killers, the Santa Fe YouthWorks food truck and kingly catering crew. Plus, Xzavian Cookbey of Freezie Fresh will float free ice cream for the first fifteen folks to cozy up to his courtyard cart. Meanwhile, you’ll be mentally massaged by the modern melodies of DJ Shimmy of Lost Padre Records, the lush ‘n’ lovely new local record store. As if y’all needed to mooch more majesty from this month, it’s the madcap bizMIX pitch contest where you’ll decide which business is most worthy to win a tiny mountain of money! Let each business bend your ear and vote on which one you think is going to add the most vibrancy to our villa real. Dig the unveiling of our latest mobile parklet, designed and built by Katherine Lee and funded by PNM for help in vitalizing vacant spots in your ciudad. Grab a map of event attractions and activities, and earn yourself a chance to win a complimentary “weekend stay” for two at El Rey Court, including a set of cocktails. And if you can’t wait to see if you win a staycation, use the coupon code MIX LOCAL to get a local’s discount on booking through August 31. Mosey on over to the Santa Fe Vintage pop-up shop and class up your act with cleverly curated goods ‘n’ such. Don’t forget to dress for the lawn/pool/bar life of yer dreams. This month’s design courtesy of Kelsi Sharp. Photography by Stefan Wachs. Would you let MIX connect you--meetup style--with people who work in a similar style to you or who might be able to help with your projects, goals, or entrepreneurial dreams? Do you feel like economic opportunity in Santa Fe is changing?